Pistol Politics marks a return to form for Paris, arguably one of the most politically outspoken artists in hip hop history. It is a fusion of some of the best gangsta and revolutionary rap talent ever, and serves as a musical statement of solidarity - and a much needed united front - against oppression and institutional racism in an age almost devoid of meaningful commentary in urban entertainment. It's both a condemnation of society's ills and a celebration of its virtues, emphasizing themes promoting unity, progression and community upliftment. Its first single and video, "Night of the Long Knives," is Paris' opening salvo and entry into the ongoing culture wars surrounding the issues of police brutality, racism and violence that have been exacerbated during his six year hiatus from music. It is a vicious commentary on America's current state of affairs, and captures the white-hot rage so many feel but rarely see reflected in the media or their popular entertainment choices. In "Buck, Buck, Pass," Pistol Politics' second single and video, Paris chronicles the carnage of escalating gun violence-related loss of life - but with a twist - detailing the journey of the life of a firearm from its perspective, from its manufactured inception to its illegal use on America's streets. His commentary on gun violence, and its often ignored racial implications and after effects, provides a spotlight on what he considers to be the real enemy - the corporate and political machinery that benefits from the steady diet of death of mainly young people of color. His third single and video, "Hard Truth Soldier (Redux)," features the trademark snarl and aggression that have made Paris a political rap stalwart, and serves as what he calls "a general statement of purpose, emphasizing the principles of self-love, self-reliance and self-determination." "Lethal Warning Shot" and "Power," Paris' 4th and 5th videos from Pistol Politics, round out the set nicely, with "Lethal Warning Shot" touching on the 2016 election, police misconduct and gentrification, and "Power" commenting on the perils of rappers not having a "Plan B" in the likely event they aren't successful in music. 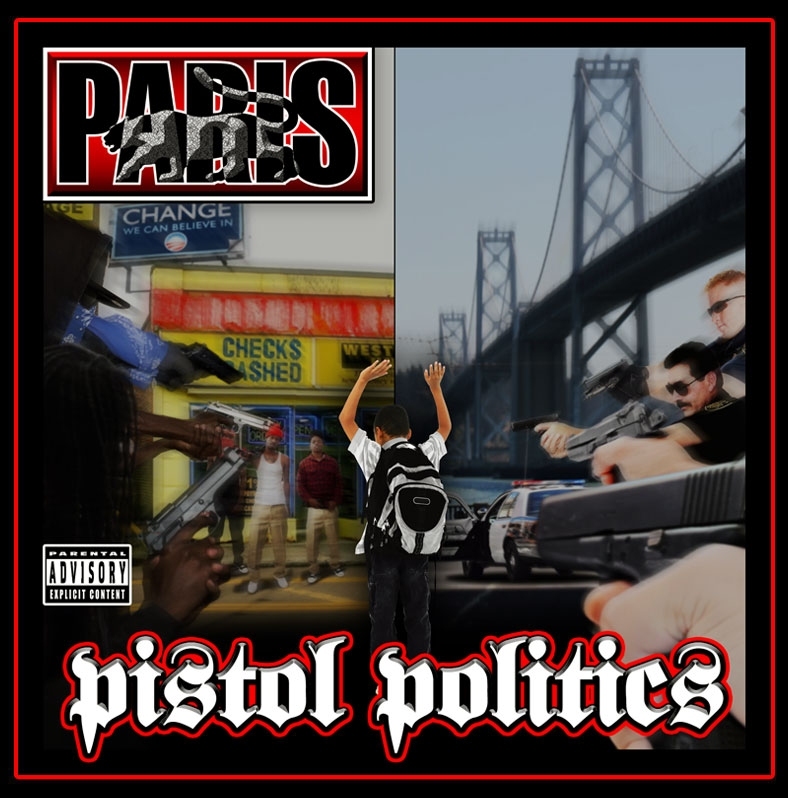 Unity is a recurrent theme on Pistol Politics, and Paris enlists top-notch talent to reinforce it, especially on the anthemic "Search Warrant," featuring WC, E-40, KAM and Tha Eastsidaz. "Truce Music" continues the sentiment, and is an infectious rallying call to curtail black-on-black violence, showcasing longtime Paris collaborator T-K.A.S.H. and newcomers K.E.V., Mellinium and B3Hree. It's all here, from the brash militancy of the dead prez-assisted "Martial Law (Redux)," to the solemn introspection of lives lost too soon in "Murder Suit," to the cautionary tales of "Brown Eyes" and "The War Dance," Pistol Politics hits all the right notes, providing a thematic album experience that moves mind, body and soul. Continuing in the tradition of artists who can be relied upon to remain consistent with both content and dedication to musical quality, this sixth effort by Paris pleases not only his existing loyal supporters, but continues to gain him many new listeners as well.